New year means new beginnings, then why not celebrate it with a fresh new greeting card? With Canva, you can design customized and stunning New Year cards that can convey warmth and love to your near and dear ones. 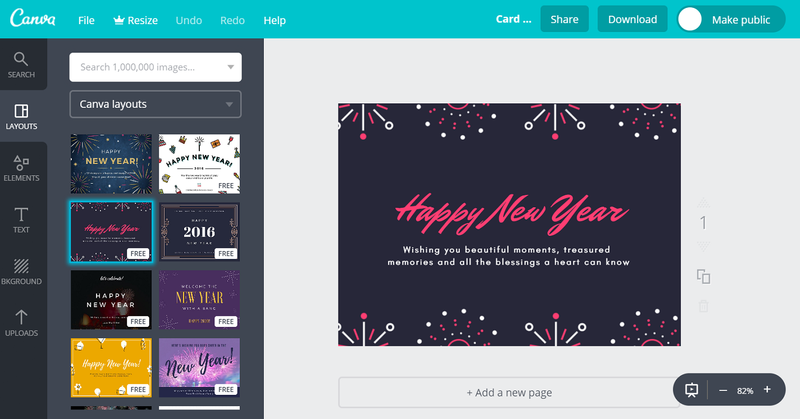 Canva’s team of professional artists has prepared refreshing card layouts for New Year that you can either use as it is or tweak as much as you like. Impress friends, family, and colleagues with a New Year greeting card capturing the right balance of joy and celebration. Creating a card in Canva is incredibly easy and quick, and it only takes a few minutes to create one. The best part about the whole Canva experience is that, it’s completely free! Design the perfect New Year greeting card in a few clicks. Create a new Canva account to get started with your own New Year card. Design a greeting card that’s visually attractive and conveys your message in the best possible way. On Canva, you can find high-quality images, vectors, and illustrations perfect for your New Year greeting card. Most of the items in our media library are free, while only a few selective ones cost at $1. In case you want to use an image saved on your computer, you can easily upload it by clicking on the green ‘Upload your own image’ button. All the uploaded images get saved in the upload folder and they can be used for future designs. All card layouts available on Canva come with the perfect greeting messages. In case, you want to edit or replace the text; you can do that with the text tool. Also, there are beautiful pre-designed font combinations and typography which you can use for your card. The designs you create on Canva can be accessed anytime and anywhere. Thus making it convenient to make changes as and when creativity strikes. Your Canva account homepage is where you’ll find all your designs. Just select the one you want to work on, make edits, and share or download the final design. Thanks to Canva’s iPad app, you can now design and make changes even on the go. Just download the Canva app from Apple Store (it’s free), login to your account and start designing. Send your New Year’s greetings on time with Canva. You can share your greeting card online via multiple options like email, Facebook, Twitter, and LinkedIn. All you have to do is click on the share tab and select the desired option. Another option is to forward your card as an image on messaging apps like Whatsapp and Viber. For this, you will need to download your design in JPG format. In case, you want a hard copy of your design, Canva allows you to download professional quality print file of your card. Just, click on download tab, select Print-PDF option, and you’ll have a 300DPI (dots per inch) image saved on your computer which you can easily print. Can I find inspiration for my New Year’s greeting card design on Canva? Canva is the perfect place to get great designing inspiration. We have multiple templates available, each containing amazing layouts created by professional artists. Also, through ‘Get design inspiration’ tab on the Canva homepage, you can find fabulous designs created by other Canva users. Are there any restrictions on the number of printed copies of the greeting card? Print as many copies of greeting card you want and wish everyone a happy New Year in style. However, if your greeting card has any premium visual elements, then you can print up to 2000 copies only. In case, you have used free elements or added your own images, then there are no such restrictions. Can I use my New Year’s greeting card next year as well? Oh yes, absolutely! You can re-use your New Year’s greeting card next year. All you have to do is select the design, make necessary edits, slightly tweak the design (color scheme, background) and in no time you’ll have a new card ready to greet everyone.